I prefer raising goats in cold weather. I have had the opportunity to raise goats in Arizona, moved to Alaska and I think they get along better and maybe are happier in this colder temperature. I know you know how important water is to all livestock, especially goats. They are pretty fussy drinkers. When it gets really cold out and snow is all over the place, it's easy to cut corners and not keep the water as clean as it should be or as full as it should be. Don't be cheap on hay during the winter months. 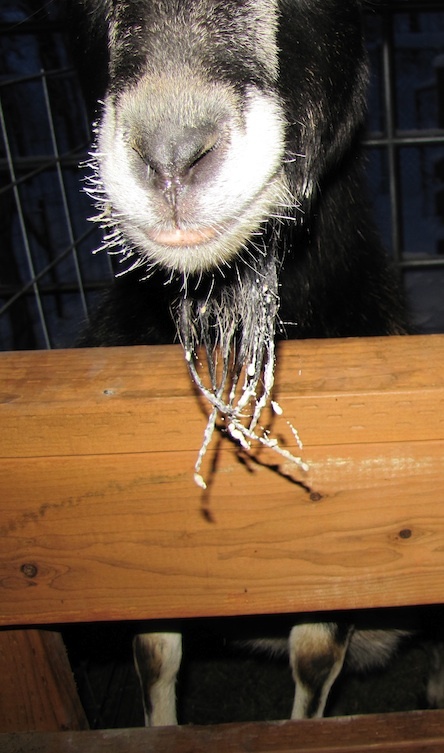 Goats love to nibble when they get cold. Any left over hay will be most efficiently used to lay on. Excellent bedding is critical. 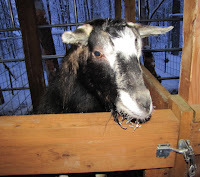 During the coldest months, I do not clean the goat stalls daily, I throw more hay or straw and allow their bed to build and provide more insulation to their bed. Goats do not necessarily need a fully enclosed barn but they certainly need constant relief from rain and snow and protection from the wind. I do not believe in over-feeding any of my livestock, especially goats but during the coldest nights here in Alaska, I provide a little extra cracked corn or some of my home-made goat treats just to give them something to chew on and get their minds off of the cold temperatures. On the first day of January, 2012, at the Red Fence Farm here in Palmer Alaska the thermometer read minus 15.